It’s been almost a month since my last post, and now the calendar tells me it’s only eight weeks until Ironman. There’s still so much training to do until I’m ready. Training ramps up this week to over 18 hours and I know that I have the toughest few weeks ahead of me. On top of that, my baby is getting married on 31st January. At least that will allow a couple of enforced recovery days. 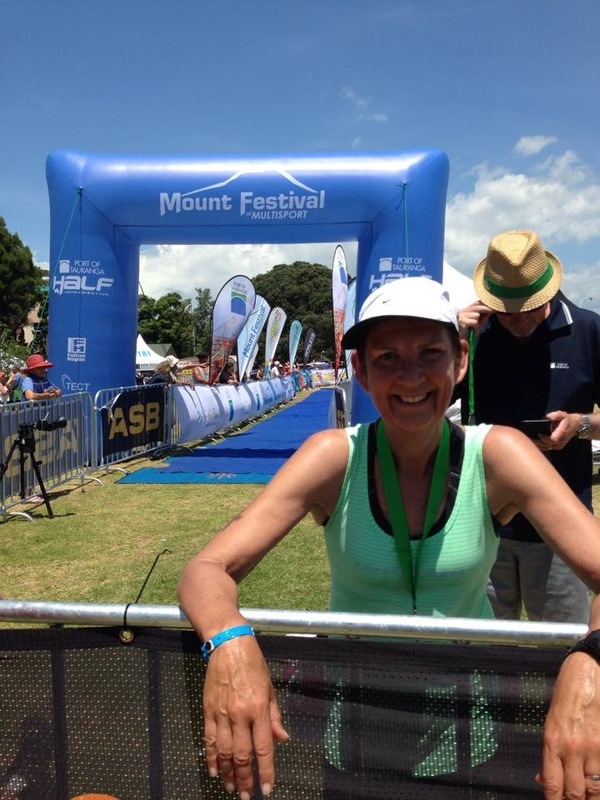 So, what has happened since my last post, the day after the Rotorua Half Ironman? My swimming hasn’t got much faster, but I have completed a 3km swim in the lake. I can almost say I enjoy lake swimming now. 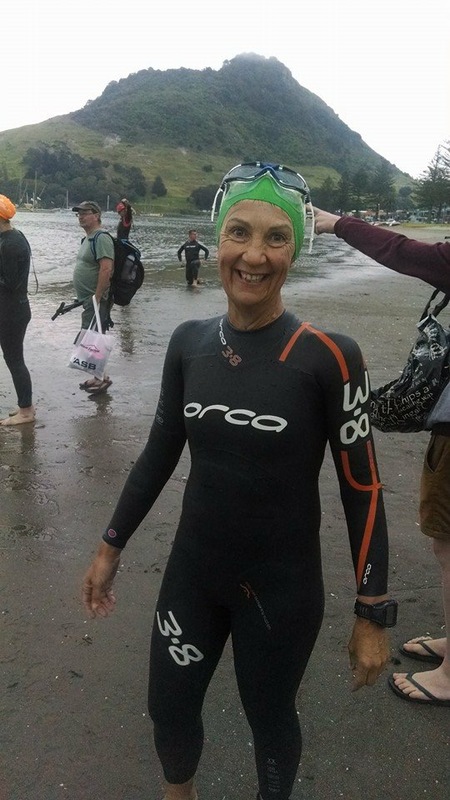 On Saturday, in the Port of Tauranga Half Ironman, I had my first ocean swim. The salt water didn’t bother me, but the boats in the bay were a bit tricky, especially when they obstructed my view of the buoys. I just hoped that the boat I was swimming towards was the one with the buoy behind it. I went out with the ‘slowbies’, which may not have been such a good idea. There were less people to follow, which made me feel a little insecure. Cycling is probably my strength at the moment. I finally have my bike set up the way I need to have it for Ironman. Last week I swapped my borrowed aero bars for my own aero bars; looks like I won’t be giving up cycling after IM. I also purchased a new seat, which is something I’d been concerned about for a while. I know that you can expect some discomfort on a ride of 90km plus, but when the pain starts to slow you down before you get to 75km there must be something wrong with the seat. Yesterday’s 90km ride in the POT Half was pain free. I’ve also added a third bottle cage to my bike, which is needed for my new nutrition plan on the bike. It’s taking a while to get my running legs back. The Plantar Fasciitis is totally under control. I ice after every run, sometimes twice, and roll my foot with an iced golf ball, along with doing the yoga Toes Pose. The newer problem is forefoot pain in my right foot after running for over 1.5 hours. Mr Google has helped me, and it seems that the problem is Metatarsaglia. This means more icing and adding more foot exercises to my current regime. The pain has already gone, so I should be able to keep it at bay with self care and maybe some Panadol late into my long runs. My foot will be fully tested on my 6 x 1km hill reps on Wednesday. I have learned a lot about nutrition over the past couple of weeks. I hadn’t realised just how important it is to get your nutrition right, while on the cycle leg. It makes sense that you need to ensure that you have enough energy for the run, by the time you get off the bike. I’ve started to use Hammer Perpetuem along with Gu Brew and water. My favourite solids foods are bananas, dried apricots and Emms Power Bars. Today was a ‘How to …’ demonstration and practise day. I have been putting off learning to change a tyre tube. So far I haven’t had a puncture, but this new learning had to happen. It’s far too risky to trust that I won’t get a puncture on IM day. There will be daily practises for the next few days, and then weekly practise until I have it completely sussed. Last week I used a WATT bike for the first time. I had insisted that I couldn’t get my heart rate much above 126 bpm when cycling and my coach wanted to prove otherwise. She was right. I managed to get my HR up to 162 and could sustain 144 for a while. The bike also measures the percentage of power you use with each leg when pedalling, so if you are favouring one leg, you can work on evening up your pedalling power. Given the option of spending 90 minutes on my wind trainer at home and 90 minutes on the WATT bike, I have chosen to travel to Papamoa to use the bike once a week for the time being. 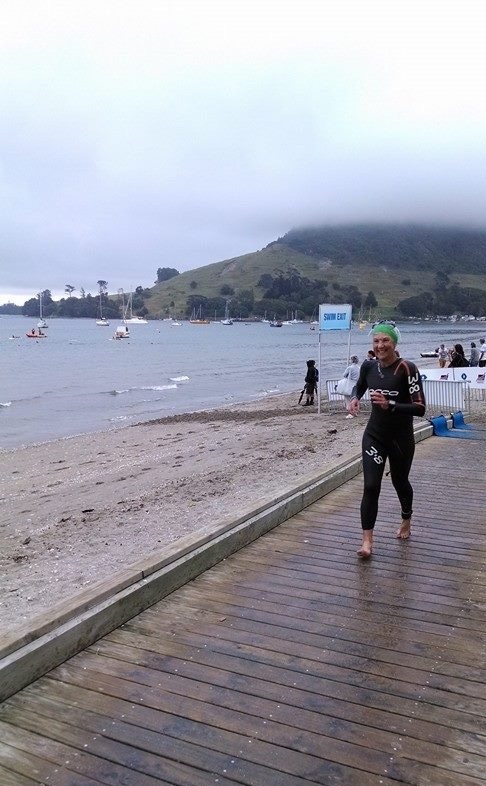 Below are some pics from the Port of Tauranga Half Ironman. Overall I was thrilled with my day and time of 7 hours 30 seconds. 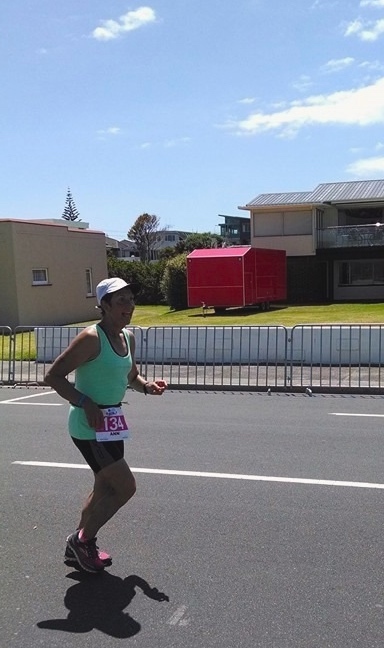 I will take the 45 minute improvement on my Rotorua Half IM time, even though I know Tauranga was an easier event. Pre- swim. Excited, but nervous anticipation. The run into transition from the swim. Plodding along, enjoying the support. Satisfied and happy with my day. Husband, Andy and coach, Louise. There at the finish line. 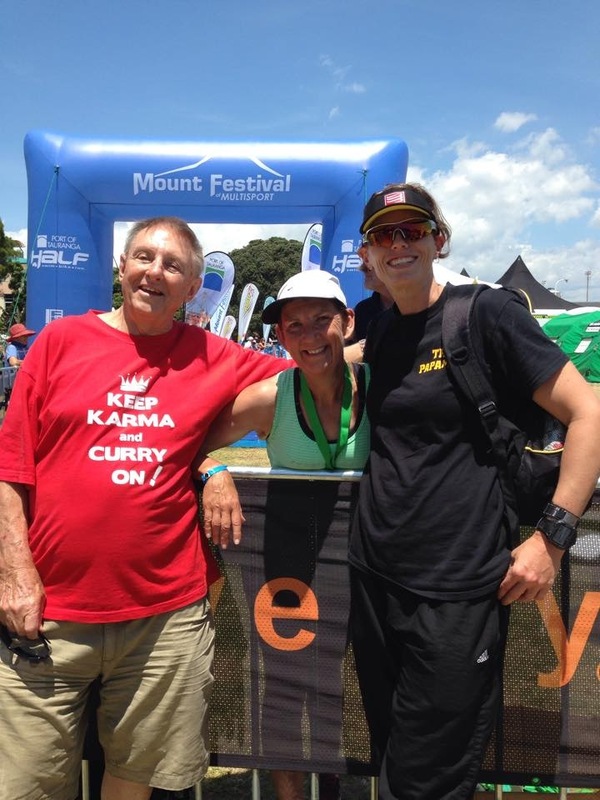 This entry was posted in Uncategorized and tagged cycling, ironman, nutrition, running, swimming. Bookmark the permalink. It must be an amazing journey to get to this place where you are ready to do an ironman. Good for you. Keep up the training in these last important weeks. And keep having fun out there.